Blockchain venture builder Coinsilium Group Ltd (COIN) says that RIF Labs is acquiring RSK Labs, where Coinsilium owns 65,000 series Seed-1 preferred shares. The cost of the investment was $83,750. The acquisition is a share for token swap and Coinsilium will end up with 1.95 million RIF tokens, which is the equivalent of 139.4 bitcoins, currently valued at $773,000. However, an initial 12.5% of the consideration will be released six months after the deal is completed and then 2.5% each month for 42 months. NQ Minerals (NQMI) has entered into an additional marketing and off-take agreement with Traxys Europe. The deal covers the production from the Hellyer project in Tasmania for the first five years. This includes a facility for prepayment. Tectonic Gold (TTAU) says that its Australian subsidiary has received a A$590,000 tax rebate from the Australian government. A 43.5% rebate is due on qualifying technical expenditure and so far more than A$2m has been received. Spending continues. Gowin New Energy Group Ltd (GWIN) chief executive Chen Chih-Lung is lending £40,000 to the company for 12 months at an annual interest rate of 2%. Music and audio equipment supplier Focusrite (TUNE) is continuing to grow internationally although Asia is growing at the fastest rate. Full year revenues grew by 14% to £75.1m, while pre-tax profit improved from £9.51m to £11.3m. The dividend is 22% higher at 3.3p a share. There is £22.8m of cash in the bank and this could be used for add-on acquisitions. Tariffs on Chinese exports are being used as a way of testing out price rises for the US market. Forecast profit growth is modest but there is potential for outperformance. Tristel (TSTL) is buying its distributor in Benelux and France and this will enhance earnings. The maximum payment for Ecomed will be €6.8m (£6m) with €5m paid up front. The deal also provides an additional warehouse in Europe. A full year contribution in 2019-20 will increase pre-tax profit by £700,000 to £6.5m. Sustainable timber supplier Accsys Technologies (AXS) has increased its capacity for Accoya production by 50% and this will help production in the second half. Demand for Accoya is strong and sales increased from €28.3m to €31.1m in the six months to September 2018. The development of the Tricoya plant in Hull is progressing. Construction could be completed in the middle of 2019 and it will breakeven at 40% of capacity. Tricoya, which is used in MDF-type panels, is currently produced from Accoya and this plant will free up Accoya production for other customers. Numis forecasts a rise in full year revenues from €60.9m to €73.1m and a decline in loss to €5.1m. Net debt is expected to be €46m at the end of March 2019 and it will continue to rise because of the capital investment programmes. If partners can be secured in the USA and Asia then this could provide a significant boost to the company. Initial drilling results at the Havieron licence area in Western Australia provided good news for Greatland Gold (GGP) with two wide zones of gold and copper mineralisation intersected. This significantly extends the known mineralisation. Immunodiagnostic System Holdings (IDH) is up to its old tricks. The interim figures were published at 5.04pm on Friday 23 November. To be fair this is 14 minutes earlier than the half year trading statement so maybe the company is improving. Here’s hoping. Interim revenues were flat at £18.5m but the company fell into loss. There was £27.8m of cash in the bank (net cash of £26.5m) at the end of September 2018. Maybe some of this should be spent on an alarm clock so management can get up in the morning to release its results. Chris Jagusz has stood down as chief executive of Redcentric (RCN) as revenue growth has been hard to come by. The latest interims have sparked downgrades for 2018-19 with revenues cut by 5% to £94.2m. SIMEC AtlantisEnergy (SAE) has singed a joint venture with AD Normandie Developpement and this will enable the commencement of tidal energy projects between France and Alderney. A capacity of 3,000MW is being targeted and there is potential for EU grants. Innovation software provider Imaginatik (IMTK) has achieved annualised cost savings of £1.2m, but the strategic review held back revenues and new orders in the first half. The cash outflow declined. Trading levels are picking up. There are no competition concerns about the Ebiquity (EBQ) disposal of its advertising intelligence business to Neilsen Media Research. The business has been underperforming because of the uncertainty and this will enable the deal to go ahead. Ebiquity says that 2018 operating profit will be lower than expected. Positive news about the Wressle oil project, where the planning officer for North Lincolnshire has recommended approval. The original application was refused two years ago. Operator Egdon Resources (EDR) owns a 30% interest in Wressle, Europa Oil and Gas (EOG) has a 30% interest and Union Jack Oil (UJO) has a 27.5% interest. Humber Oil and Gas owns the other 12.5%. Integumen (SKIN) has raised £355,000 from a placing at 0.44p a share. This cash will support the development and commercialisation of Labskin. Integumen is paying €40,000 and six million shares to former chief executive Declan Service. Sutton Harbour (SUH) returned to profit in the six months to September 2018, although the corresponding period had a hefty asset write-down, and it is raising cash for pre-construction funding. An open offer of 77-for-786 at 29p a share will raise up to £3m and close on 6 December. Planning approvals have been received for the Sugar Quay and Harbour Arch Quay schemes in Plymouth. Electronic and battery products supplier Solid State (SOLI) is starting to improve its performance, although there may still be a decline in full year profit. In the six months to September 2018, revenues were 5% ahead at £23.6m and pre-tax profit improved from £1.55m to £1.66m. The interim dividend was 5% higher at 4.2p a share. The order book was worth £29.6m at the end of September 2018. TomCo Energy (TOM) has appointed Turner Pope to replace SVS as broker and trading in the shares has recommenced. SEC (SECG) is acquiring France-based public and corporate affairs business CLAI. An initial 10% stake, but with 50.1% of voting rights, will cost €490,000 in cash. A further stake of 40.01% will be acquired in the second half of 2020 and another 10% in the second half of 2023. The shareholders can ask SEC to buy the remaining shares between 30 July 2025 and 30 November 2025. The final payments are based on an earnout although the maximum will be €8.8m. In 2017, CLAI made a pre-tax profit of €551,000 on revenues of €4.49m. The acquisition could be earnings enhancing. CLAI will continue to be run by existing management. Majestic Wine (WINE) is finding the UK market tough and margins are coming under pressure. Peel Hunt has reduced its 2018-19 pre-tax profit forecast by £2m to £12.8m, partly due to increased investment in Naked. Kestrel has increased its stake in Pebble Beach Systems (PEB) to 22.2%. Another disappointing trading statement from Fire Angel Safety (FA.) has led to a 2018 profit downgrade. Stock problems and delays to orders have hit the smoke alarms supplier. Scottish legislation due to be passed next year should provide a boost to demand. Fire Angel will be loss-making in 2018 but should make a small second half profit. Legal services firm Knights Group (KGH) says that interim figures will be in line with expectations with double digit organic revenue growth. The interims will be announced on 15 January. Maritime identification systems developer SRT Marine (SRT) had already flagged its 9% increase in interim revenues to £3.2m and increased underlying loss of £1.3m. There was little contribution from the GeoVS analytics system. There are expected to be significant deliveries in the second half, but timing cannot be guaranteed. A full year profit of around £3m is expected if the deliveries do take place. SRT is no longer considering investing in its own satellite constellation for this business. FIH Group (FIH) reported flat interim profit, although there was a sharp improvement in contribution by the Momart art and museum logistics business. There was a decline in the performance of the Gosport ferry and Falkland Islands activities. Lawyer Gateley (GTLY) says interim revenues will be one-fifth higher at £46.4m with around 50% of this organic growth. Full year revenues should be at least £102m. EBITDA margins should be maintained suggesting full year EBITDA of more than £19m. That is slightly higher than previous consensus. Argentina-focused oil and gas producer and explorer President Energy (PPC) says the first Puesto Flores development well is producing at 600 bopd, having peaked at 1,000 bopd. This is as much as was anticipated from all three development wells. The results from the second development well appear positive and testing is about to commence. finnCap believes that the first well could have a post-tax NPV of $20m. Pallett developer and manufacturer RM2 International (RM2) is raising £13m at 105p a share, following a 200-for-one share consolidation. This replaces the second tranche of a previously announced placing which would have happened at 1p a share (200p a share equivalent) but RM2 did not meet the performance requirements to spark the other placing. All but one of the investors set to buy shares previously will subscribe to the new placing. The cash will be used to fit track and trace devices to existing pallets, produce new pallets and cover admin costs. The cash will last until next April. finnCap has sharply downgraded its pre-tax profit forecasts for telecoms services provider Maintel Holdings (MAI) due to project delays. The 2018 figure has been cut from £12.9m to £9.8m and the 2019 figure from £16.1m to £12.7m. The 2018 dividend is still expected to be 34.5p a share, although the cover will fall to 1.6 times. There is a move towards recurring revenues which will have a longer-term benefit for Maintel. Restaurants operator Tasty (TAST) has revised its £7m term loan facility, which will be extended until March 2022. Quarterly repayments will be reduced from July 2019, by which time the amount draw down will be reduced by £1.1m. Net debt is currently £4.3m. The NAV of value-focused investment vehicle Gresham House Strategic (GHS) has held up well considering the stockmarket decline. It grew to 1264p a share at the end of September 2018 and it was still 1243.2p a share on 16 November. The stake in IMImobile (IMO) has been reduced but it remains a strong performer. Cloud communications software supplier IMImobile improved its interim revenues by one-quarter and organic growth was 15%. The growth came from the European and American operations. Established customers are buying more services from the company and acquisitions are supplementing growth. Liontrust has increased its IMImobile stake to 21.4% but Kestrel has cut its to below 3%. Payment protection software provider PCI-PAL (PCIP) is paying former boss William Catchpole his contracted entitlements plus £100,100 in settlement of his claims. The board unanimously asked Catchpole to leave in October. The final loan note repayment of £250,000 has been received from the buyer of the contact centre business. Digital and media recruiter Nakama Group (NAK) reported flat interim net fees of £2.7m, but it managed to return to profit thanks to reduced costs. Further cost cutting is underway. There was a £558,00 cash inflow from operations and net debt was £488,000. Antennas developer MTI Wireless Edge (LSE: MWE) has completed its merger with Israel-quoted majority shareholder MTI Computers and the initial benefits will show through in the second half. The interim figures show organic growth in revenues of 2%, but that growth should accelerate in the second half. Water management technology provider Mottech is winning new business and there are good prospects for the other divisions. The NAV is 17.8p a share and the full year dividend could be 1.25p a share. Two directors have invested nearly £230,000 in shares in Condor Gold (CNR) at 22pa share. Non-executive Jim Mellon took his stake to 7%, while executive chairman Mark Child has reached 6%. Condor has been granted an important environmental permit for the development of a processing plant at its La India project in Nicaragua. SRK Consultants is preparing an updated mineral resource. 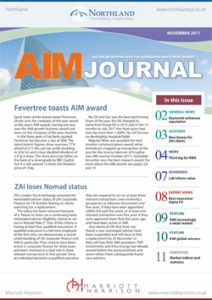 Juridica Investments Ltd (JIL) plans to leave AIM as part of the process of winding-up the company. The quotation will be cancelled on 21 December after liquidators from KPMG Channel Islands are appointed. Management fees will be reduced. Online women’s fashion retailer Sosandar (SOS) continues to build up its sales, having been trading for two years, and they reached £1.84m in the six months to September 2018. The loss was nearly £2m. Returns were 52% but that was put down to a high level of dress sales in the period and it can be more difficult to get the right fit. The benefits of the move to the Magento 2 ecommerce platform and the investment in the website are showing through in the second half. October was a record month. A placing raised £3m after the balance sheet date so pro forma cash is £5.56m. 600 Group (SIXH) has rationalised its UK business and sorted out its pension problems. Interim revenues were slightly ahead but underlying margins improved from 5.1% to 6%. The machine tools and laser marking equipment supplier is expected to improve its full year pre-tax profit from $3.05m to $3.9m. Motor dealer Cambria Automobiles (CAMB) has performed well considering the dip in the new car market. Used vehicles and aftersales offset some of the decline. There was a 2% decline in revenues to £630m and underlying pre-tax profit fell by 13% to £9.8m. The capital investment programme for new sites has peaked and the benefits of that investment are still to come. Veltyco Group (VLTY) is still finding it difficult to collect the money it is owed. This means that its cash is running low and this will impact its ability to promote its own brands. Graphene materials supplier Directa Plus (DCTA) is confident that it will achieve 2018 revenues of €2.3m and this figure could double in 2019. Growth is coming from textiles, environmental and elastomers customers. Ubisense Group (UBI) is selling RTLS SmartSpace for up to £35m, which is around two-thirds of the software company’s current market value. The group had cash of £6.8m in the middle of November 2018. Funds managed by Investcorp Technology Partners will pay an initial £30m. Liabilities of £3.1m and a loan of £1.75m will have to be paid out of the proceeds. The company’s name will be changed to IQGeo and it will focus on the myWorld product, which helps telecom companies to integrate their technology ecosystem. The myWorld business generated interim revenues of £5.7m but £3.2m was geospatial services from third party products. Some of the cash will be distributed to shareholders. The decline in annual pre-tax profit at Stride Gaming (STR) from £18.9m to £14.8m was no surprise given the impact of regulation and tax. The online bingo and gaming company is likely to report a further fall in profit this year. A special dividend of 8p a share has been announced and in future 50% of net earnings will be paid in dividends. Packaging and labels supplier Macfarlane Group (MACF) continues to grow revenues organically, supplemented by recent acquisitions. Organic growth has been 5% and overall growth is 13%. The fourth quarter is important, though. Full year pre-tax profit is forecast to improve by 47% to £13.6m and earnings per share by one-third to 7p. Acquisition payments should be offset by cash generated in the second half. S and U (SUS) has increased its investment in Aspen Bridging from £20m to £30m. Aspen has been trading for less than two years and is already in profit. Creightons (CRL) increased its interim profit by 44% to £1.38m on revenues one-third ahead at £22.3m. The main growth in sales has come from retailer own brands, while Creightons own brands raised their sales by 11%. David Brown has sold his 4.55% stake in Associated British Engineering (ASBE). Sealand Capital (SCGL) has formed a new subsidiary called ePurse (HK) Ltd, which is generating commissions from WeChat Pay activities in Hong Kong. Licences have been obtained in the UK and Dubai. Veni Vidi Vici Ltd (VVV) joined NEX on 2 August. The minerals investment company has net cash of £513,000, following a £490,000 subscription at 50p a share. The focus will be precious metals and base metals opportunities in Australia, Western Europe and North America. Management will concentrate on capital appreciation. EPE Special Opportunities (ESO) is changing its domicile from the Isle of Man to Bermuda. The private equity investment company will have to be readmitted to NEX and AIM. EPE has invested £2m in Main Market-listed LED lighting company Luceco at 39.74p a share. That takes EPE’s stake in Luceco to 27.4%. Poor trading has meant that the Luceco share price has slumped to well below its 2016 flotation level. EPE has redeemed 50% of its unsecured loan notes. Etaireia (ETIP) has appointed Dennis Rogers as chief executive. He has more than three decades of experience in property development. Equatorial Mining and Exploration (EM.P) has issued 2.685 billion shares, around one-quarter of the enlarged share capital, to wipe out the convertible loan note debt and other creditors. Twenty three year old Devon Marais, who works with ARQ Minerals, which is helping Equatorial to extract coal from the St Leonard’s mine in Nigeria, has been appointed as a non-executive director of Equatorial. Asia Wealth Group Holdings (AWLP) reported a profit last year. In the year to February 2018, revenues increased from $1.52m to $2.16m, while a pre-tax loss of $110,000 was turned into a pre-tax profit of $150,000. That figure was helped by a $114,000 currency gain, compared with a $19,000 loss. There was still a small net loss from operations before other income. Petrol stations operator Applegreen (APGN) intends to take a majority stake in UK Motorway services operator Welcome Break. The purchase of a 55% stake for €361.8m would be a reverse takeover. The deal would make Applegreen market leader in the UK as well as Ireland. A subsidiary of Stride Gaming (STR) has been issued a notice by the Gambling Commission, which intends to levy a significant financial penalty because of the manner in which it carried on its trading. This is not final and there might be room to appeal but it has hit the share price of the online bingo operator. The Property Franchise Group (TPFG) increased interim revenues by 11% to £5.3m. Most of the growth came from management service fees from the property lettings franchisees. The EweMove estate agency business was profitable. Goldplat (GDP) says that gold production fell by 17% to 35,400 ounces, which is lower than anticipated, but pre-tax profit will be in line with expectations because of a higher margin per ounce. There was 39,400 ounces of gold sold during the year. Beximco Pharmaceuticals (BXP) has received abbreviated new drug application approval from the FDA to sell Nadolol tablets, which are a generic form of Corgard and used for managing high blood pressure. This is the fifth approval in the US. A pre-tax profit of £33.3m is forecast for the year to June 2018. Tough UK trading and higher costs held back the results of security and facilities management services provider Mortice Ltd (MORT) in the year to March 2018. Revenues were 21% higher at $219m, but underlying pre-tax profit was down by 16% to $3.9m. Net debt was $18.4m. Precision marketing software supplier Pelatro (PTRO) is acquiring assets from the Danateq Group for an initial $7m. The deal will take the group into central Europe and adds to the recurring revenues base. A placing has raised £6m at 73p a share. GetBusy (GETB) grew its interim revenues from £4.5m to £5.2m, with £4.5m of that figure recurring revenues. Annualised recurring revenues are running at £9.4m. Profit generated from document management software sales is being ploughed back into developing the existing product and the new GetBusy software. There is £2.37m in the back. Starcom (STAR) says that interim revenues have improved from $1.92m to $3m and the loss will be lower. Most of the revenue increase came from two large clients. Growth is starting to come from higher margin security products. The 2018 loss is expected to be much lower than last year’s. Kosovo-based quarry operator Fox Marble Holdings (FOX) increased interim sales from €329,000 to €614,000 and the second half has started strongly. The benefits of investment in capital equipment are beginning to show through. Argo Blockchain (ARB) has joined the standard list after raising £25m at 16p a share, which values the company at £47m. However, the share price fell to 12.5p by the end of the first day of trading on 3 August. Argo is developing a global datacentre management business facilitating cryptocurrency Mining-as-a-Service. It currently covers four cryptocurrencies. AIM-quoted Vela Technologies (VELA) owns 2.5 million shares, which were acquired for 8p a share. Motor finance provider S&U (SUS) achieved record first half profit as the second hand car market continues to grow. Quality standards have been tightened with 25% of applications accepted, but net receivables have reached £263m. The property bridging loan book has risen from £11m to £16m over six months. The interims will be announced on 25 September. BigDish (DISH) was originally going to reverse into AIM shell Nyota Minerals Ltd but instead it has joined the standard list. The company operates an online and mobile restaurant reservation platform, which is in operation in the Philippines, Indonesia and Hong Kong. The purchase of Pouncer, takes the company into the UK. Revenues come from booking fees per diner. BigDish raised £2.22m at 4.5p a share. Path Investments (PATH) is raising £10m to complete the farm-in agreement with 5P Energy for the proposed acquisition of a 50% participating interest in the Alfeld-Elze II licence and gas field. This will make Path cash generative. The new shares will be eligible for EIS and VCT relief because Path is moving to AIM. Dave Brieth has sold his stake in telecoms services provider Toople (TOOP). Associated British Engineering (ASBE) reported a sharp increase in full year revenues from £1.04m to £1.6m in the year to March 2018. The loss fell from £962,000 to £582,000. This includes investment in developing new diesel engines. The NAV is £976,000, as the loss was partly offset by a £600,000 property revaluation gain. The oil and gas-related operations are still depressed. Mila Resources (MILA) plans to acquire Capital Metals, which owns 100% of a high-grade mineral sands project in southern Asia. The reverse takeover will be subject to due diligence and shareholder approval. Fandango Holdings (FHP) has ended bid discussions with Corporate Commercial Collections and Vatbridge following initial due diligence. Sativa Investments (SATI) has made two investments in the past week. A C$200,000 investment in Rapid Dose Therapeutics Inc has been made prior to a flotation. The company’s QuickStrip fast-dissolving strip technology can be used to deliver medicinal cannabis. The other investment is in Veritas Pharma. A further C$200,000 is being invested in Veritas, which develops and commercialises medicinal cannabis treatments for chronic pain and palliative care. Gunsynd (GUN) says that Danish software business FastBase Inc is delaying its flotation. An AIM quotation was originally planned but it may come to the standard list. There may also be a corporate transaction. Gunsynd has a 10% stake in Sunshine Minerals, which has announced that the authorities in the Solomon Islands intends to issue a prospecting licence for its nickel project as long as it gains right of access with land owners. Wheelsure Holdings (WHLP) reported halved revenues in the six months to February 2018. Orders for the company’s rail systems and technology have been disappointing due to tight budgets and admin delays. The interim revenues fell from £104,000 to £46,000. Walls and Futures REIT (WAFR) raised £80,000 from an open offer at 94p a share. Capital for Colleagues (CFCP) had a NAV of 41.5p a share at the end of February 2018, down from 43.5p a share one year earlier. The employee-owned business investor invested £324,000 in the latest six month period. There is £789,000 in the bank. Stride Gaming (STR) intends to get rid of its poorly performing social gaming business and concentrate on growing its online gaming operations internationally. Licences are being applied for and Italy should be up and running in the near future. As expected increased regulation and tax are holding back profit. Revenues should grow this year but pre-tax profit is expected to decline from £18.9m to £14.2m and be flat next year. Watkin Jones (WJG) increased its revenues by 18% to £158.3m in the first half. Pre-tax profit was 12% ahead at £23.6m. Student accommodation developments remain the core but build to let developments will become more important over the coming years. There is even potential for a separate operation focused on build to let. Full year pre-tax profit is expected to be £48.1m. Sanderson (SND) put in a strong first half performance. The enterprise software provider had an initial contribution from Anisa but even so the like-for-like profit was higher even though like-for-like revenues only edged up. The retail business was the main driver of profit growth and the improved order book, which increased from £2.78m to £8.61m. The like-for-like order book was 16% higher. The interim dividend was increased by 14% to 1.25p a share. Earnings per share rose by 44% to 2.3p a share, helped by a lower tax charge. Oxford Metrics (OMG) has completed the disposal of its Yotta Surveying business to Ginger Group. The sale of the highways surveying business will generate £1.3m in cash. Oxford Metrics still owns the Yotta software. GetBusy (GETB) has made a strong start to 2018 with revenues 17% ahead in the first four months of the year. Stockdale expects the software company to increase its profit from £1m to £1.6m this year. River and Mercantile has sold its shares in InterQuest (ITQ) and Chisbridge has increased its stake to 51.4%. This comes at a time when InterQuest is seeking to cancel the AIM quotation and investors are being offered 24p a share. Best of the Best (BOTB) has received the full £4.5m VAT claim from the HMRC. There will be fees and costs to offset against this. On the negative side, HMRC says that the company owes retrospective remote gaming duty for a period of four years. Frontier Smart Technologies (FST) says tough trading in the second quarter will hit the full year outcome. Expectations have been downgraded to revenues of £34.9m and EBITDA of £800,000. There will be an EBITDA loss of £1.5m in the first half. Excess stock levels hit orders for the digital radio division. Smart audio revenues are expected to grow slower than envisaged originally because of competition in the market. Development spending is being reduced. Magnolia Petroleum (MAGP) wants to cancel its AIM quotation. The oil and gas producer estimates that it will save £100,000 a year by leaving AIM. The strategy is to sell assets in order to reduce debt. Clear Leisure (CLP) is raising £600,000 at 0.95p a share. The cash will be invested in the bitcoin data mining business and fund continued litigation. Trading in the shares of Path Investments (PATH) remains suspended and the AIM flotation continues to be delayed. The acquisition of a 50% stake in an onshore gas field in Germany is progressing. The 2017 annual report should be published in June. Fandango Holdings (FHP) has secured two potential factoring and financial services acquisitions. The standard list shell would issue 908.4 million shares for the acquisition. Trading in the shares has been suspended. Predator Oil and Gas (PRD) joined the standard list on 24 May. The share price edged up from 2.8p to 2.88p. The flotation raised £1.3m to finance the plan to acquire oil and gas assets in Trinidad and Tobago and Ireland. Bisichi Mining (BISI) has acquired five shops in west Ealing (via a joint venture) for £5.6m. Bisichi and its main shareholder London and Associated Property will each own 45% with the other 10% owned by Metroprop Real Estate. The annual rental income is £140,000 and there is planning consent for 20 flats. Life sciences company Bioquell (BQE) has sold its defence business for an initial £400,000. Up to £600,000 more could become due depending on winning a particular contract in the next 12 months. This business is lumpy and it made a small loss last year. WideCells (WDC) is still finalising its 2017 accounts. The stem cell services provider is offering the chance for small investors to invest up to £450,000, via a bookbuild using the Teathers app and that was due to close on 21 May but it will be extended until the results are published. Trading in the shares remains suspended. Ryanair RYA The Ryanair success story continues with a 43% rise in profit after tax following a 16% rise in revenue and 18% in passengers, whilst the opening of over 100 new routes saw it become the first airline to carry over 100 million passengers in a calendar year. Basic earnings per share rose by 48%, average fares were cut by 1% and unit costs fell by 6%. Load factor has risen from 83% to 93% in two years. 2017 full year net profit is expected to rise by 13% subject to the strength of sterling. Michael O’ Leary has both feet planted firmly in the Remain camp, reminding us quite rightly that it was the EU which forced airline deregulation on the high fare cartel of Europe’s national carriers, thus ushering in the era of budget airlines and cheap fares. That though, was in the eighties and the EU 30 years on is quite a different beast to what it was then. Now it would probably be giving national carriers all the protection they asked for and doing all it could to ensure that Ryanair never flew a single plane. He also warns that exit from the EU will be a long drawn out process, creating a lot of uncertainty. MITIE Group MTO despite a 1.8% fall in revenue, Mitie claims to have had a good year, with strong profit and margin growth. Preliminary results for the year to the end of March show profit before tax surging by 133% to £11.25m and basic earnings per share up by 119.6%. The final dividend is being raised by 3.4% to 12.1p. per share, the 27th consecutive increase. Stride Gaming STR is to pay a maiden interim dividend of 1.1p per share for the 6 months to the end of February after a 21% rise in net revenue and 42% in adjusted earnings followed a period of what the company describes as robust growth. Cerillion CER is also paying a maiden interim dividend of 1.3p for the six months to the end of March. New orders for the half year rose by 50%, revenue by 11%, like for like revenue by 22% and adjusted profit before tax by 19%. The company says that the strong profit growth was in line with management expectations.